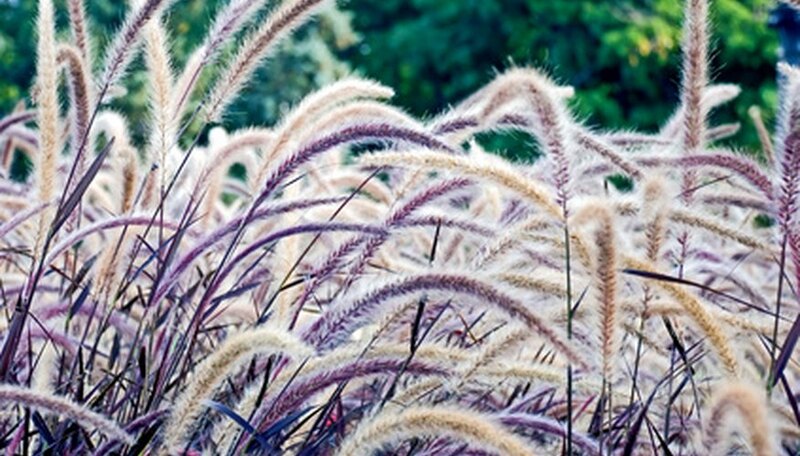 With their upright and mounding form, ornamental grasses are ideal landscaping plants to line a perennial bed or border. Many ornamental grasses are warm-season plants that require full sun and well-drained soil. Oftentimes ornamental grasses are drought-tolerant, an ideal plant to grow in arid climates. Grown in a wide variety of colors, shapes, sizes and textures, ornamental grasses are showy plants. Autumn moor grass (Sesleria autumnalis), a variety of ornamental grass, grows in a tufted mound with erect, upright foliage. Growing 15 to 20 inches tall, autumn moor grass is ideal lining a garden path. The lime green shoots on autumn moor grass becomes a silvery white color to light up the garden. Autumn moor grass is a long-lasting ornamental grass that emerges in late summer to last through fall. Autumn moor grass requires full sun to partial shade. Drought-tolerant, autumn moor grass grows well in arid climates where moisture is limited. The USDA Hardiness Zone for planting is 5 to 9. Prairie cord grass (Spartina pectinata) grows in upright clumps with arching stems that are medium to course in texture. The stiff, open shape on prairie cord grass and the dark green glossy leaves creates a commanding landscape presence. Growing 4 to 6 feet tall, prairie cord grass’s large shape is ideal tucked along the backdrop of the garden. Salt-tolerant, prairie cord grass is a warm-season grass that tolerates a wide range of soil types. They prefer full to light shade and well-drained soil. The zone for planting is 4 to 9. Ruby ribbons switch grass (Panicum virgatum 'Ruby Ribbons'), an ornamental grass variety, has a moderate growth rate and clumping growth habit. Emerging in spring, ruby ribbons switch grass has blue-green foliage that takes on a red wine color in early summer. Ruby ribbons switch grass grows 3 to 6 feet tall and 1 to 3 feet wide, ideal planted along a front yard border. Deer and drought-tolerant, ruby ribbons switch grass has red flowers that emerge in late summer for a bright burst of color to the garden. Ruby ribbons switch grass prefers full sun to part shade and a medium moisture content. Be sure not to over water. The zone for planting is 3 to 10. Fountain grass (Pennisetum alopecuroides) is a warm-season ornamental grass with an open, upright mounding form and fine texture. The dense shape is made up of the narrow, arching green leaves that turn yellow in fall. The cylindrical flowers on fountain grass are fluffy and soft and range in colors from purple to white to creamy tan. Drought-tolerant, fountain grass grows 2 to 4 feet high and lasts through fall, making for a long lasting ornamental grass. They prefer full sun to partial shade and well-drained, nutrient-rich soil. The zone for planting is 5 to 9.